• You may synchronize all of the previously defined “tasks.” You should select this option to compare and synchronize all files in all tasks on the computers. • Add a new task. If you start Easy2Sync for Outlook for the first time, you should start by defining a new “task.” With this, you define which directories should be kept in sync by Easy2Sync. 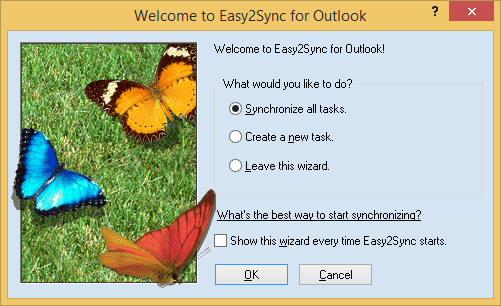 Deactivate the checkbox if you do not want the wizard to be shown at every start of Easy2Sync for Outlook.